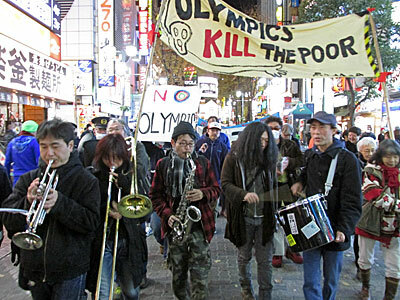 While many people in Japan are happy with the country's results of the Sochi Winter Olympics – notably, Ayumu Hirano, the youngest medal winner on the snowboard half pipe and Yuzuru Hanyu, Japan's first Olympic gold in men's figure skating, just to name a few – there are some who are speaking out against the Olympics, present and future. Given some tens of billions of dollars are used to host the international sporting event, the Olympics are never without criticism. At the opening ceremony for the Sochi Olympics, courtesy of the so called “anti-gay propaganda” law that Russia passed last year, the US President Barack Obama, UK Prime Minister David Cameron, and German Chancellor Angela Merkel were among those absent  [en]. Human Rights Watch has been urging the International Olympics Committee  [en] to investigate over non-payment of compensations for construction workers for Sochi game-related facilities. Animal rights groups are anxious that the stray dogs swept out of Sochi would be killed  [en]. The reason why all the European leaders being absent at the Sochi Olympics opening ceremony was because of an overwhelming domestic pressure to increase pressure on Russia, rather than the leaders themselves putting pressure on Russia. This is domestic politics rather than a diplomatic move. Abe was able to attend not just because of his lack of awareness of human rights, but also because there is a lack of human rights pressure in Japanese public opinion. The lesser known problem may be the history of Sochi  [en]. The Circassian people has demanded  [en] that the Russian government acknowledges the 19th-century Muhajir  [en] (Circassian Genocide), during which about 90 percent of the local Circassian population was killed or displaced by Tsar Alexander II. “NoSochi2014 “ is a website created to put more pressure on the Russian government and to gather support for the cause. 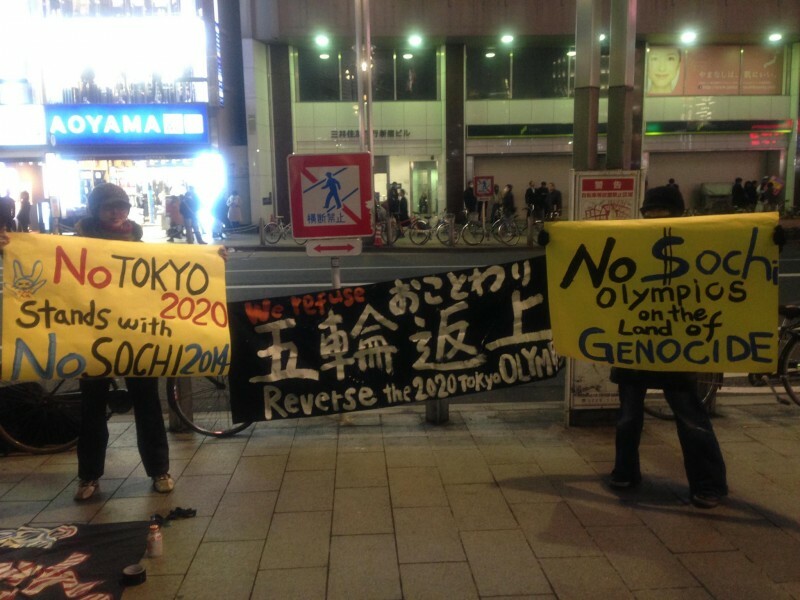 To the people around the globe fighting against the 2014 Sochi Olympics, we send you a message of solidarity from Tokyo, the host city of the 2020 Summer Olympic Games. We understand that Sochi 2014 is being held on a land where Circassian people were massacred by the Russian Empire, and today Russia is running the games on the biggest budget in the history of the Olympics. We also recognize that for the Olympics development, more than 2000 people were displaced from their homes and extreme levels of environmental destruction were brought to the land. Here in Tokyo the unnecessary redevelopment for the 2020 Olympics has already started with evictions of low-income populations from their homes. The radioactive contamination by the Fukushima Nuclear Disaster is nowhere near stabilisation, let alone “under control” as Prime Minister Abe proudly announced to the IOC. Tokyo is only swimming in the cloud of an illusion, while the people in Fukushima and many nameless radiation-exposed workers at the power plant are left without sufficient support from the state. The Olympics is nothing but a nightmare. What is happening in Sochi today, is what might happen to us in 6 years. The concerns of the group are the evictions that often take place before hosting large international events. There have been cases where homeless people staying in public parks were forcefully moved out of their tents when big events took place nearby. The group mentioned  [ja] past examples on Twitter: Before the 2002 FIFA World Cup and the 2007 World Athletics Championships, homeless people squatting at Osaka's Nagai Park [ja] were forcefully evicted. Prior to the Aichi World Expo, tents of homeless people in Nagoya city's Shirokawa Park  [ja] were forcefully removed. And, evictions in Tokyo already started in early March last year with tents and belongings of the homeless forcefully removed  when an International Olympic Committee inspection group visited Tokyo. Eviction is not only for people squatting in public parks. According to AFP  [ja], about 2,000 households at the Kasumigaoka public housing apartment in Shinjuku, Tokyo are facing eviction. Most of the residents are elderly. When Tokyo hosted the Olympics for the first time [in 1964], it was a great milestone to show off to the world that Japan has grown into a developed country thanks to economic growth. But a grand occasion in the spotlight often comes with sacrifices. Through the ages, an act of development always was followed by destruction of nature and environment. War is the biggest, worst example of destruction that does not generate anything good, but when it comes to a good reason like the Olympics, it's hard to speak against it. Especially marginalized people can never go against the orders of authorities. Fifty-four years ago, Tokyo began reconstruction on old housing prior to the 1964 Tokyo Olympics. People who had been asked to leave their old houses were moved to a newly built apartment building. But that apartment building, now 50 years old, and its old residents face another eviction for the 2020 Olympics. For Kohei Jinno, a 79-year-old resident of the Kasumigaoka apartment building, it's his second time facing eviction because of the Olympics. According to Japan Times  [en], his home and business were torn down to make way for an Olympic park around the main stadium for the Tokyo Games in 1964. Now he has been told he must move again to make way for the stadium’s redevelopment and expansion in time for 2020. Unlike the anti-Olympics group “Hangorin-no kai”, most people in Japan are not against hosting the games themselves, but some are against tearing down the existing stadium to build a new, larger one. Edward Suzuki , a Japanese architect, suggested on his blog fixing up the already existing national stadium rather than simply building a new one and called on people to join the campaign on online petition platform Change.org. The petition “Saving Meijijingu Gaien and National Stadium for Future Generations  (unofficial translation) argues that throwing large amount of taxes away to build a new giant stadium which would be too huge, raising issues with emergency guidance and risk management in the event of disaster, will only prevent recovery efforts for areas affected by the Tohoku earthquake and tsunami of 2011 and will destroy the city's scenery, such as Ginkgo trees and the blue sky. All this, the petition warns, will become a burden for future generations. Tokyo residents, as the leading actors for the city, must stay strong and pay close attention to this massive change that Tokyo will go through “for the 2020 Olympics”, not just the plan to rebuild a new stadium, so that such development will not proceed in an non-transparent way.